They came to jog, to walk, to bike and sightsee. They came to push their babies, build their muscles and interact with others. And, they came by the hundreds, passing by in heat that threatened to sear the green grass around them. 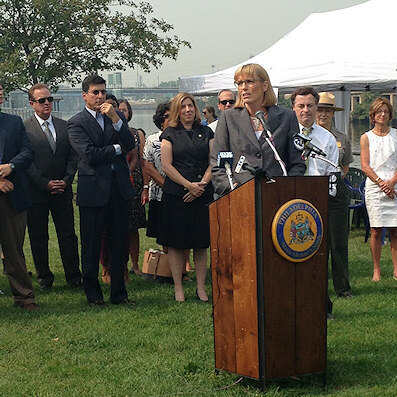 DCNR Secretary Cindy Adams Dunn addresses the crowd at the Schuylkill River Trail. 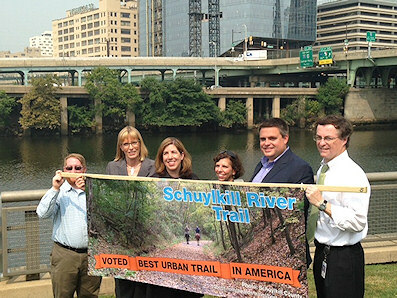 The DEP chief was among a long list of national, state, and local officials and trail enthusiasts who gathered Sept. 2 to celebrate the Schuylkill River Trail being named USA TODAY’s Best Urban Trail. The event took place on Schuylkill Banks and was hosted by the Schuylkill River Heritage Area in partnership with DCNR. “I have to tell you how happy a day this is for the men and women who work for DCNR,” Dun told the gathering. “A huge cheer went up when this trail was named the best urban trail in America. Raising the banner along the Schuylkill River Trail. USA TODAY’s 10Best Readers’ Choice Award for Best Urban Trail featured trails from across the country. A panel of travel and outdoor recreation experts nominated 20 trail systems located near major U.S. cities and turned to USA TODAY and 10Best readers to vote for their favorite trail. Supporters say the Schuylkill River Trail’s win is a testament to its popularity for locals and tourists alike, and the region’s dedication to improving access to multi-use trails and public space. The Schuylkill River Trail is the region’s most heavily used multi-use, recreation and commuter trail, and maintains a strong reputation as not only a local amenity, but a tourist attraction as well. When complete, the Schuylkill River Trail is projected to be nearly 130 miles long, connecting five Pennsylvania counties—and will be a key corridor of the Circuit trail network and the East Coast Greenway. Currently 300 miles of completed trails, the final Circuit is a planned 750-mile network of bicycle and pedestrian trails connecting people to jobs, communities, parks, and rivers in the Greater Philadelphia Region. A filmed glimpse of the ceremony can be found here.